Photo: Ko Phi Phi back beaches. So you’re on Ko Phi Phi and have negotiated the back alleys and rabbit warren of Ton Sai Bay to find the cheapest habitable digs you can find. Yes, 1,000 baht doesn’t go far on this glistening little island. The bags are thrown in the corner and it’s time to wash the ferry grunge off. The only problem is, you wandered down to Ao Lo Dalam and found a scene straight out of Khao San Road meets The Beach meets The Hangover — and it’s not even early afternoon. 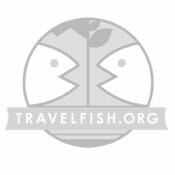 Don’t despair, Travelfish.org is here, with pointers to five beaches on the island we’d rate a solid nine out of ten. Yes, before you know it you’ll be frolicking just like Leonardo. See that clear spot between the lobsterised Brits and the Swedish posers on Ao Lo Dalam? Stand there, look out to sea and peer to your left. You’ll see one of Ko Phi Phi’s trademark outcrops. What you probably can’t see is the beautiful and 100% undeveloped beach behind it. Grab a kayak and a large bottle of water and set off. Be warned, it is a longer paddle than it looks (it took us, a thoroughly un-kayak-worthy traveller, about 40 minutes each way) but it is absolutely worth it. The only residents are of the furry with long tails variety, but they keep their distance (unless you’re stupid enough to bring bananas with you). We spent almost two hours here, walked the length, peered at our ancestors, swam a bit, slept a bit and saw four other tourists the entire time. 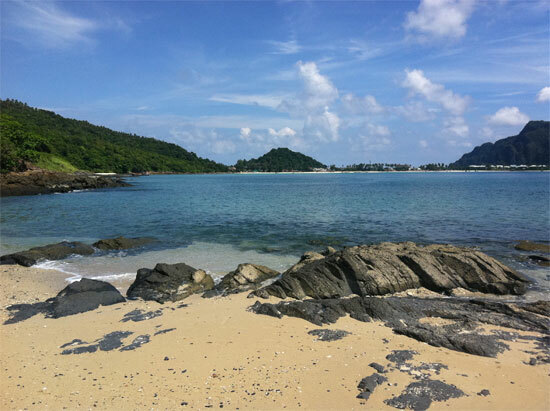 Warning: There is a second Monkey Beach off Tonsai Beach to the west — ignore it. Tourist trap. The easiest way to remember the name of this beach is “Moo Dee” — as in “Moody” as in “really grumpy Thai rastas who run the sole beach joint on this absolutely stunning bay“. Lo "Moody" Beach. Island nuttiness at its best. Sure Israelis have a bit of a reputation for being heavy-going, but when they feel the need to put up a sign saying that “Israelis will not be served”, we think it really says more about the proprietors than the patrons. Island madness aside, this is a capital B beautiful beach with some good snorkelling and plenty of fish. 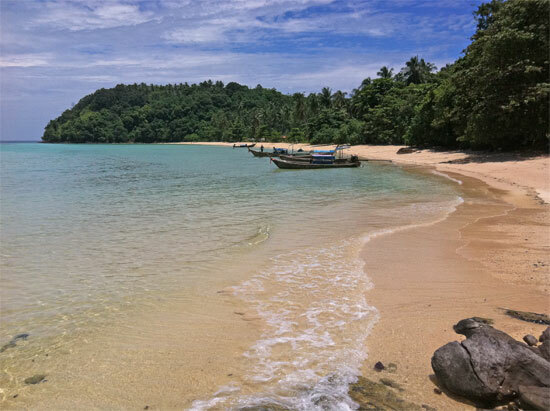 To get here, walk to Long Beach, past there to Phi Phi The Beach Resort and follow the road. Where the road doglegs, you’ll see a rough trail leading straight ahead — that will lead you down to the back of the coconut plantation filling the bay. Free tip: bring your own water as the rasta shack charges about three times the going rate — which possibly explains the cause of the initial blow up with Israelis. Yes, we’ll be the first to admit this isn’t actually a secret beach. After all, a resort hibernates nearby and a bunch of fishermen were hanging out doing not much when we staggered out of the woods and onto the scene, but given the looks we got, we imagine this beach is secret enough that few travellers wander this far. The snorkelling is good. Just you and a few rocks. Start on Ao Lo Dalam, break right. Go past Sunflower Bar (our favourite bar on Ko Phi Phi), past PP Sunset Pavillion and past the next thatch joint that is probably finished by now. Keep going. Yes, keep going. Eventually a road appears out of nowhere; follow it. This will deposit you behind Sunset/Sunrise Resort (sorry can’t remember which — sweat melted our notes on the way back), which was closed when we visited; then make your way down to the beach. You’ll reach a roughly 10 foot-high rocky ridge that you can climb over. Climb over it. Scramble over the last of the rocks and you’ll find a little, crescent-shaped sandy bay. Some good snorkelling lies offshore here and believe us, you won’t be sharing it with anyone else (that’s code for travellers who like to get their gear off). We’ve long had a sweet spot for Ao Toh Ko. While the cost of accommodation has, well, skyrocketed, we still think this is one of the prettiest spots on Ko Phi Phi, but Oh Dear Lord it nearly killed us walking back from here — get health insurance or get the boat! This is one of the few beaches on Ko Phi Phi that gets reliably frequent reports of people getting to snorkel with dolphins. Really, do we need to say anything more? Martyrs that we are, we’ve never had the privilege of doing so, but we did come across a pod of dolphins about 200 metres south of this bay while on a longtail a few trips ago, so we do believe the stories and so should you. Accommodation is available (Tohko Beach Resort) and the food is good and drinks cold, meaning this is an ideal spot for a daytrip of beach beachdom. How to get here: Get the boat. Too expensive? Walk to the viewpoint (one hour of sweltering pain and agony) followed by another 40 minutes walking back down the other side along a crappy, ill-defined, even-worse-signposted trail that is awash with spiders and ants that BITE REALLY HARD. Let us know if you need the boatman’s telephone number. 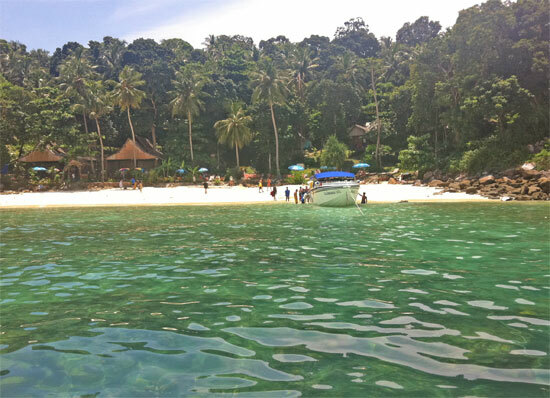 Ao Poh is one of those beaches best reached by boat. It is best reached by boat primarily because trying to reach it by land (despite having walked there many times on past trips to Ko Phi Phi) is maddeningly confusing and seems to forever deposit you back at Phi Phi Hill Resort. Bye bye Phuket speedboat daytrippers. The bay is home to a single, basic bungalow operation, the (imaginatively named) Ao Poh Resort which is closed in low season, but the sand is clean and there is good snorkelling offshore — watch out for the urchins though. The appeal here is the proximity to Long Beach (five minutes on foot if you were ever to figure out the way) or 10 minutes by longtail. And while in low season they take daytrippers in from Phuket for a buffet lunch, the rest of the time the beach is devoid of people — not even any monkeys. So there you go, five beaches a little off the beaten trail — Ko Phi Phi is a very big small island and, with a bit more looking around, some other beaches are no doubt well worth finding. That kayak? Head right instead of left and let us know what you find. All excited? Browse Ko Phi Phi hotels on Agoda.com — lowest rate guaranteed. 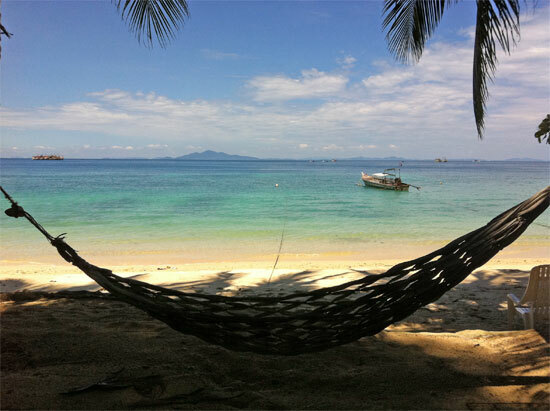 Browse our independent reviews of places to stay in and around Ko Phi Phi. 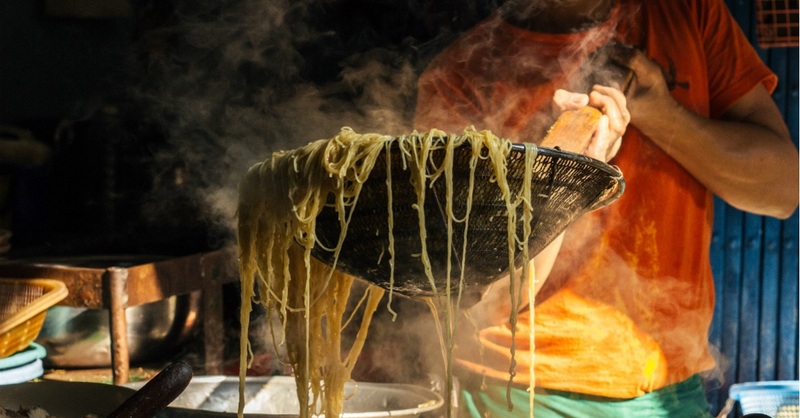 Read up on where to eat on Ko Phi Phi. Check out our listings of things to do in and around Ko Phi Phi. 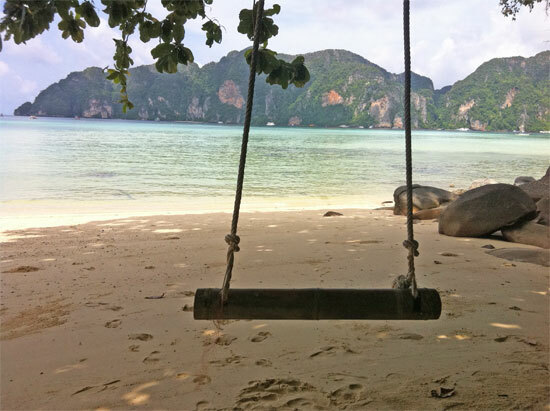 Read up on how to get to Ko Phi Phi, or book your transport online with 12Go Asia. Planning on riding a scooter in Ko Phi Phi? Please read this. See below for more sights and activities in Ko Phi Phi that are listed on Travelfish.org. 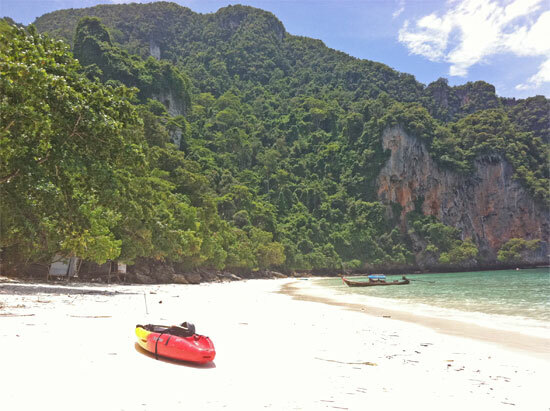 Where are you planning on heading to after Ko Phi Phi? Here are some spots commonly visited from here, or click here to see a full destination list for Thailand.